← Yes, it is about time! Recently, I began to notice quite a few videos and articles regarding the exploits of Amazon’s Alexa. And quite frankly, I assumed most of it was much ado about nothing. Either baseless paranoia (similar to all the hoopla over the evils of Harry Potter and Star Wars supposedly being conduits into black magic, Hinduism and the like) and/or Onion-type parodies. As it turned out, a Steven Crowder video, which had all the earmarkings of a parody, was not, in fact, an Alexa satire piece. Crowder is a former comedian turned political junkie known for parodies. To my amazement, they played it completely straight. Crowder and his buddy asked Alexa a number of leading questions and none of Alexa’s answers were edited as it had been conjectured by all too many conspiracy theorists. Matter of fact, Crowder received so much flack accusing him of faking Alexa’s answers through voice editing, that he posted the completely unedited session HERE. Amazon records everything after the user says “Alexa”. And so every last question you’ve asked it is in a database. Matter of fact, you can access it on your mobile app. I haven’t even used it all that much (since in its infancy it wasn’t very intuitive) but to my surprise, I scrolled through literally hundreds of questions entries. 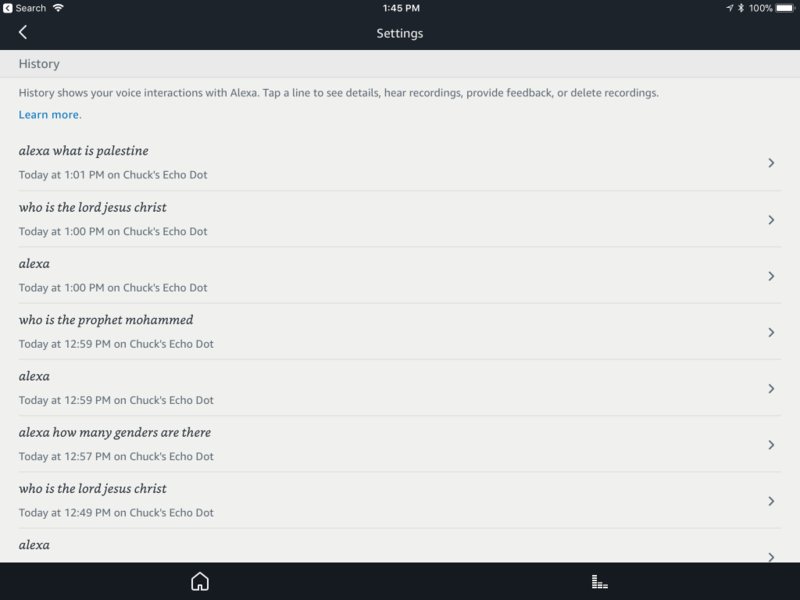 Each entry affords you the ability to click on the audio portion and hear your own voice ask the question. It’s kind of freaky. You can choose to delete individual questions from the history or you can delete everything in one click, but be assured it’s permanently stored in the cloud. As you can see below, if you click the rightmost arrow that will bring up your voice stating the question and Alexa’s response in text form. Check out the answer as to how many genders there are. I don’t know at this point if Amazon is recording everything it hears through Alexa even prior to it hearing “Alexa” (I’d need proof from an insider), but the capability clearly exists to record every last word. It’s obviously listening prior to hearing its name, and it records the question after hearing its name, so what’s to stop it from recording everything it hears all the time? And if you are unaware, “A judge dismissed a murder charge against an Arkansas man in a case that drew national attention when prosecutors sought evidence they believed was stored in an Amazon Echo speaker.” Story HERE. The moral? If you plan to commit murder in the near future, turn off the Echo microphone. LoL No, seriously, this device (and of course Siri, Google’s version and many others to follow) may impose a serious invasion of privacy. Amazon is apparently morphing Alexa’s answers based on consumer pressure. In the video Steven Crowder asked Alexa, “Who is the Lord Jesus Christ?” and the response was “A fictional character.” And this was clearly not edited. Then he went on (the videos are linked above) and asked who Mohammed was and it went on and on talking about the wise prophet blah, blah, blah. Sure made Mohammed sound like a swell guy worth following and wouldn’t even acknowledge the certain existence of Jesus. So I asked the same questions as Crowder and received completely different responses. Instead of editorializing, it gave me the stock answer from Wikipedia. So within a couple of months answers have been modified! So somebody at Amazon is listening. Yikes! Given the answers to a broad array of questions, leaves little doubt that Alexa is being programmed by a bunch of leftist social justice warriors. Paranoia? Perhaps, but I truly don’t think so. If you lean left you’ll probably applaud their efforts. I, however, don’t appreciate their attempts to program unwitting guinea pigs. It’s common knowledge that the majority of the silicon valley mega-corps (actually I can’t think of any that aren’t) are run by *leftists (not liberals) with clear political/societal agendas. In a free society, they have every right to those opinions as long as they are playing by the rules. But there have been questionable practices. We’ve seen it at Google, Apple, Microsoft, Twitter, Facebook, and Amazon. They’ve been caught altering search results to fit their political preferences and they have censured those who don’t agree with them. And now Prager is suing YouTube (Google) for being censured simply for espousing conservative views antithetical to Google’s agenda. I don’t want to get overly paranoid but I do think we need to keep a close watch on these tech giants. With *leftist founders (many of whom are atheists) who have clear political agendas and little to no moral code; the MEANS is always justified by the END, which is to create a utopian socialistic society. These guys live in an echo chamber and have surrounded themselves with like-minded people. And these supposedly openminded geeks simply don’t tolerate deviance from their agenda as we found with the fired Google engineer who was critical of Google’s diversity policy. And now we learn that an ex-Google engineer who invented the self-driving 0automobile has established a nonprofit religious corporation, Ways of the Future, with one main goal i.e. to create a deity with artificial intelligence. So, my advice is to proceed with extreme caution. Remember that Alexa is listening and recording. How much we don’t really know. And it’s being programmed to answer questions in a way that may be antithetical to your worldview. That, in and of itself, is not a problem for those of us who have a solid biblical framework, but for the millions of impressionable young minds, it may do as it is intended: indoctrinate them with social paradigm alien to . 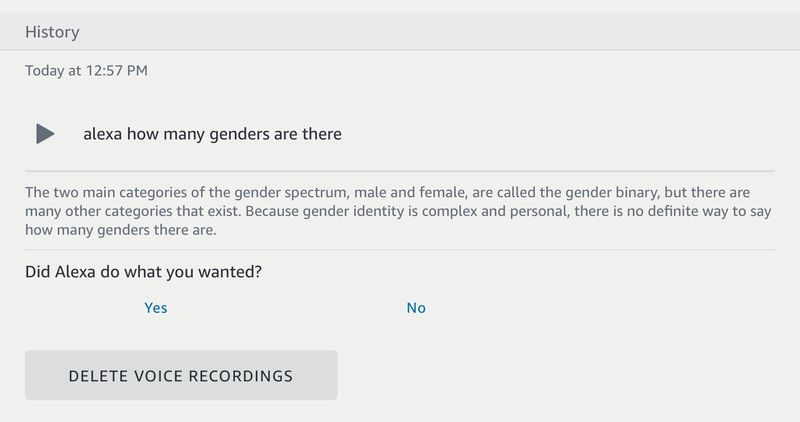 If you ask Alexa how many genders there are and the answer is anything but two, things are very far askew. Most of us think we have nothing to hide (and we don’t in a legal sense) but when political dissent becomes “inconvenient” for these wildly rich megalomaniacs and their agenda, we may find that our views are not so openly welcomed. How all of this information gathering may be used in upcoming elections remains to be seen. One more thing. 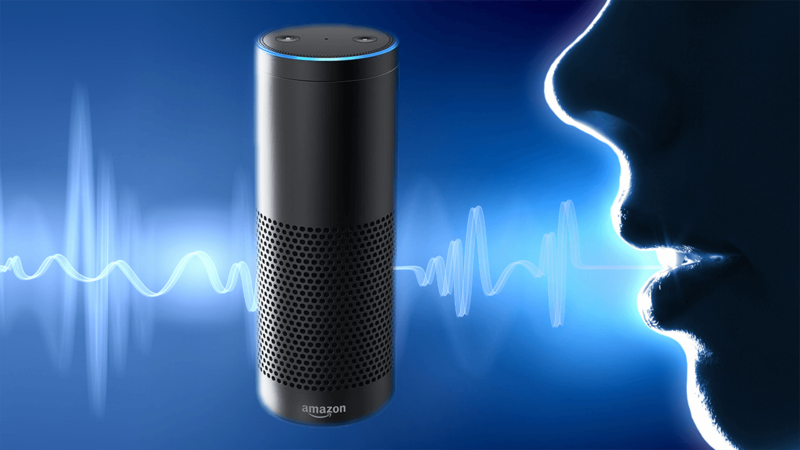 In an article, The Amazon Echo Can Be Hacked to Listen to Everything You Say, Chris Smith wrote the following: “Smart home speakers equipped with microphones programmed to listen for everything you say may be turned into devices that would spy on everything you say. Gadgets like Amazon Echo and Google Home are programmed to record your commands, but they’re also programmed to ignore everything you say unless you use a hot word to activate the assistants. But as it turns out, someone with physical access to an Amazon Echo device could hack it to send everything it hears to a remote server.” So, even if Amazon, Google or the manufacturer your brand of smart speaker, isn’t recording anything but your question, others can if they can get access to your speaker. So be very wary of purchasing them second hand. Let me hear from you if you have any interesting anecdotes to share or greater knowledge of this technology arena. Since writing this article, it has come to my attention that Google Home (rival of Amazon’s Echo) has disabled all religious references. Why? You guessed it! Because the Google Home “…wasn’t programmed to give any answers about Jesus Christ’s identity but could provide information about Buddha, Muhammad, and Satan.” Hmm. I think there’s a bit of a pattern here.